It’s been a hot, dry summer in Michigan, unless you count the days that my wife, Denise, and I have gone camping. It has rained every time that we camped. No joke! Let’s do a quick recap, shall we? The rain was so bad this weekend that we did not even leave the house. 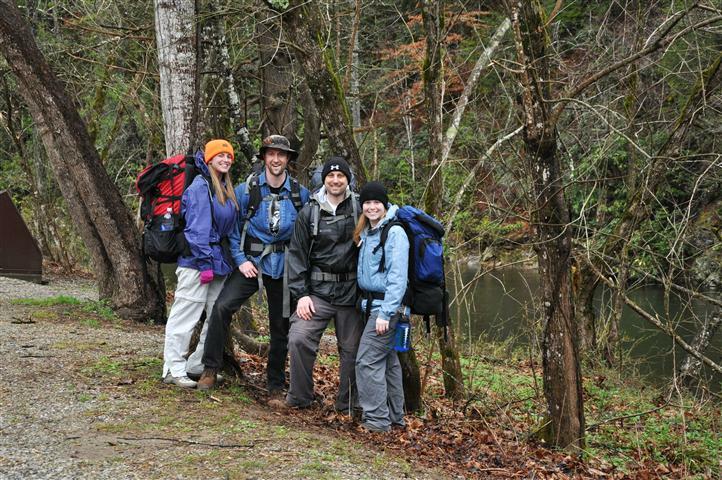 We planned on taking a hiking trip with our friends, Tim and Shanna, but the forecast was for 90 degrees and thunderstorms. This time, the forecast did not lie and it rained cats and dogs. 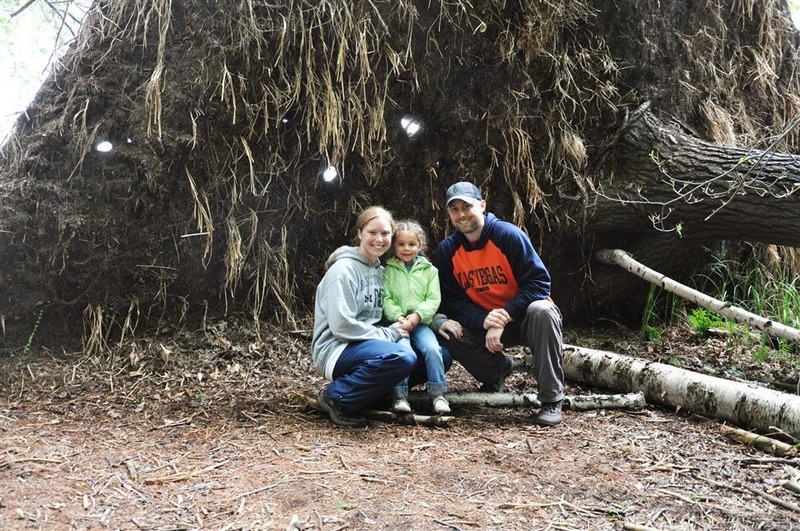 We took our four year old niece, Adriana for her first weekend of camping in Leelanau. It was no longer 90 degrees, instead it was 60 degrees and raining. Adriana was not happy that we couldn’t swim, but we had a great time on a bike when we visited the lighthouse. 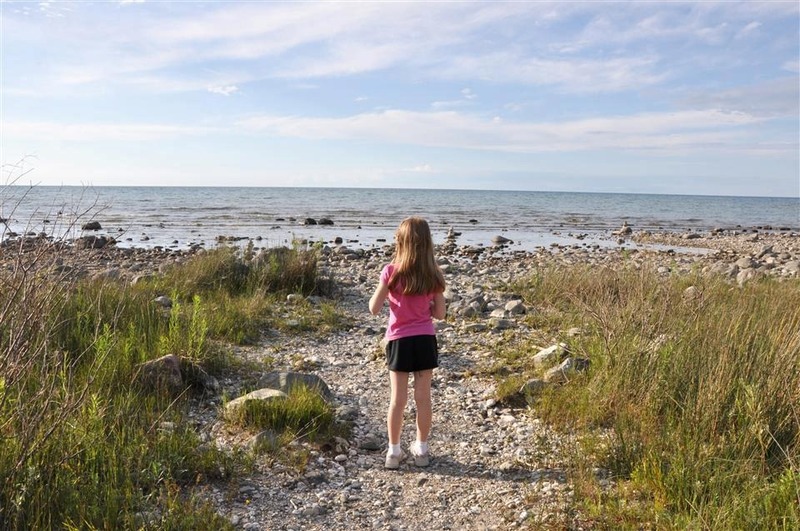 Later in the month, we took Amelia, our seven year old niece, camping for the second year in a row. We loved the rustic campsite on the shore of Lake Michigan, but once again the weekend was interrupted by rain. 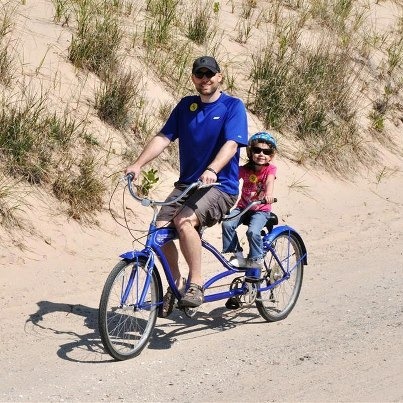 We were lucky enough to have one great, sunny day to hit up Sleeping Bear Dunes. We fled to the U.P. to escape the heat, and found ourselves with 100 degree days in the Porcupine Mountains! We enjoyed a great hike through the mountains the day after our 12 hour drive, and then it was on to Copper Harbor. We were joining in with my parents and two sisters who were taking and extended trip through the U.P. And what did it do in Copper Harbor? You guessed it, it rained. This time it was a huge thunderstorm that rocked our tent and made us very glad that we mostly stayed dry. Our Coleman Hooligan is a great tent. We ditched the tent, and borrowed Betty, my parent’s RV, for a weekend up north with Denise’s sister’s family and two brothers. We all had a great time, except that it rained! It rained all afternoon after we went to the beach. It stormed minutes after we got back in the water that afternoon. It rained during lunch. It rained during dinner. It stormed the entire second night! The park host said it hadn’t rained there the entire summer until we showed up! It’s a good thing we had that RV. The backpacking tent we brought for Denise’s brothers did not hold the water out, and they would have been soaked the second night. 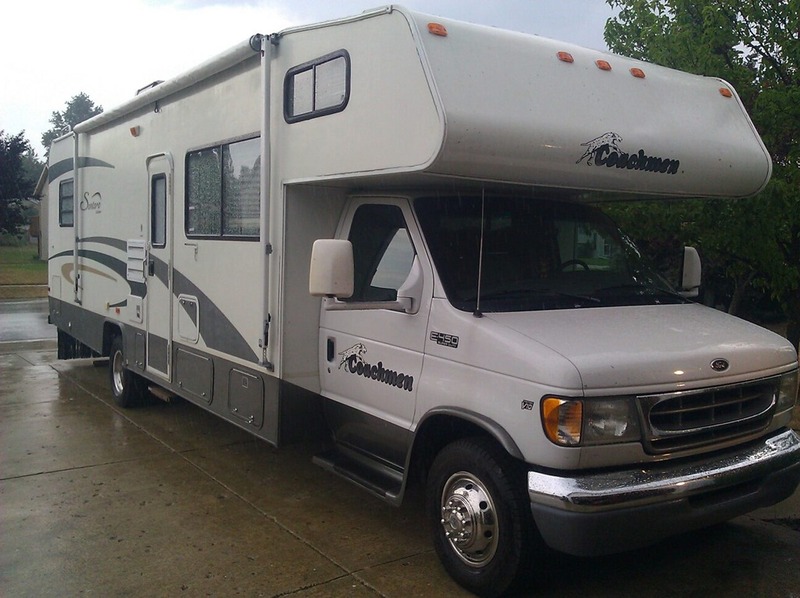 Instead, we piled six adults and two children into the RV. So, with that, I announce my new business! If you need rain, you can hire me for $100 / day plus travel expenses. I will come to your location in my tent or RV, and it will rain, 100% guarantee (unless my presence brings fire instead of rain. That’s happened in Idaho and in southern Australia). Book at your own risk. You may get more than you bargained for. My wife, Denise, and I like to travel. We don’t often get to travel with our friends and family, but we love to take them with us to share in our adventures. To do that, we write about our adventures and share pictures. Typically, it is enough to share our Travelpod site and keep that updated as we go along. But in May 2011, as we rolled across the open plains on our way to Moab, Utah, I decided that a standard travel blog was not going to be enough. You see, we really wanted to share the experience with our two nieces, Amelia and Adrianna. 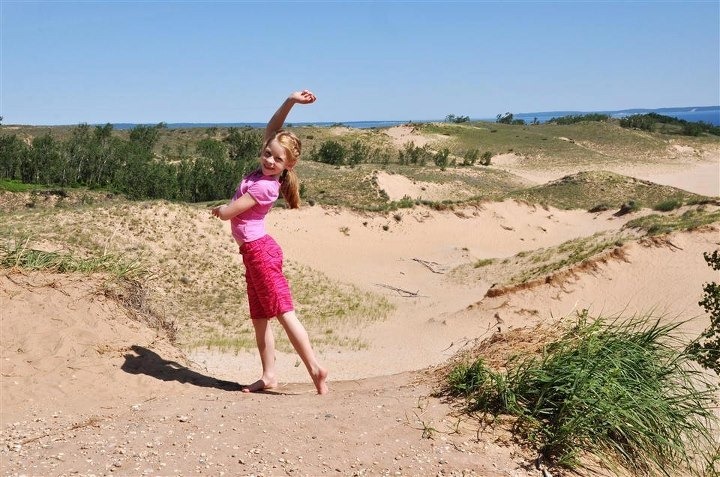 They are a bit too young for a cross country road trip (or we’re too old to want to travel that far with a six-year-old and a three-year-old), so I decided to write a story about them. In the story, they would take the road trip with us. In order to add a dash of adventure and daring, I set the story back in the 1870s and put them on the Oregon Trail. With Denise’s excellent photography and book layout skills and a lot of editing help from my brother-in-law, Patrick, I was able to have it printed and ready for them in time for Christmas. I figured they might. They love books, and what’s better than reading a story about yourself? And since they liked it, I thought a few other people might enjoy it. A few weeks of Kindle formatting later, and I published it through the Kindle Store! Click the image to purchase! I’d love for you to take a read. This is a book for kids, but don’t go in expecting Dr. Seuss. 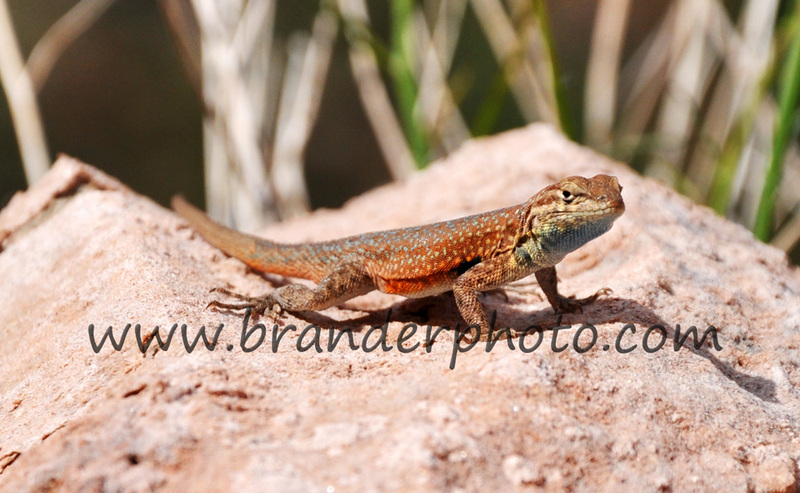 There are lots of words, but we offset that with over forty beautiful photographs that Denise took on our trip West. Don’t have a Kindle? You don’t need one! Just buy it with your Amazon account, and it will ask you where you want to send it. You can purchase without owning a Kindle! Just choose to use the Cloud Reader. It’s actually a great way to read the book, and the photos are in full color and look amazing. If you do read it, I would really appreciate it if you left a review on Amazon! And if you do or don’t read it, I’d love it if you shared this article, or a link to the book on Facebook, Twitter, or any other social site. And now, here’s a quick excerpt from the book. PA WAS in the barn. It seemed he was there an awful lot lately. Amelia remembered that last winter, Pa spent most of his time playing with her and building a rocking horse. He had painted the horse black. She and her little sister called it Chocolate and loved to play on it. Ma was in the kitchen salting beef and putting it in jars and crates. Her shoulder-length, curly, auburn hair kept falling into her eyes as she worked. Usually Ma would sit with Amelia and play school with her. Amelia would answer questions like 19 + 7 or How many apples did Susy have left if she picked 10 and gave 3 away? Ma told her she was really smart. Her little sister, Adriana, would listen for a while, but then she would take Ma and Amelia’s coffee order and bustle off to her imaginary kitchen. She would return quickly to serve it before taking the pretend dishes to pretend wash them. Even Grandma was busy in the kitchen; she had been working since before the sun was up! Grandma had short, black hair and always had a loving smile for Amelia. It sure seemed odd to Amelia that Grandma and Ma would be working so hard. The food for the winter had already been gathered and stored; Amelia had even helped this year! Amelia was a tall, thin, red-headed girl that would turn six in the spring. Her big, beautiful, brown eyes did not miss a thing. She was always interested in what the grown-ups were doing, and she was smart enough to understand most of it. Adriana, was a pretty little girl with curly brown hair and an easy laugh. She was too intent on her jigsaw puzzle and cooking imaginary food for her dolls to notice the change in routine the last few weeks. Amelia had done her best to ignore it, but her curiosity was getting the better of her. She stood up from her math flash cards and yelled to her mother in the kitchen. Her mother’s reply was lost in the howl of the wind from the suddenly open door. Pa stood in the doorway with an excited look on his face and a letter in his hand. His usually neatly-combed brown hair was mussed from the wind and he must have knocked his small, round spectacles as he hustled inside. They were crookedly hanging to the side of his large nose. “Carolyn! It finally came!” he yelled. “Shut the door before we all catch the sickness,” Ma yelled back. Pa came in with Grandpa right behind. Grandpa’s windblown, white hair was sticking straight up in the air as he ambled over to Adriana. He laughed as he grabbed Adriana under the arm pits and swung her into the air. Adriana squealed with excitement. Ma came out of the kitchen and Pa swept her up into his arms and twirled her around. “That is fine news, David! We have just about finished packing the food for the trip,” Ma said. Amelia and Adriana both perked up at the sound of their favorite Aunt and Uncle’s names. They did not see them often because they traveled so much, but they were great fun to play with. Amelia was happy to see her parents smile. She knew they worked very hard to put food on the table and a roof over her head. But she also felt uneasy. She didn’t know what Independence was or what a pie o’ near could be. She sat back down and listened intently to the strange and complex world of the grown-ups. You gotta love four day weekends. I’m lucky enough to get one twice a month. This time, I took Denise to Washington D.C. for her birthday. The drive down took about 15 hours. We decided to hit the side roads just outside of Pennsylvania. The eastern border of Ohio, West Virginia and south-east Pennsylvania is some beautiful and hilly country. It added four or five hours, but we saw some fun things in the mountains. We got to our hotel around 9pm and pretty well headed off straight to sleep. Saturday was sunny and warm. We spent the morning walking around the mall and looking for some food. We found some at a great little place called Breugger’s Bagels. That was tasty! I spent much of the morning recognizing landmarks and metro stations from a video game called Fallout 3. If you an Xbox 360, check it out sometime – especially if you think you know Washington D.C.
Around 11, I received a text from Denise’s cousin Joe. He and his wife were in town to surprise Denise at the Nationals baseball game we were going to. Denise surmised that I was texting with work, so we were able to pull off the surprise perfectly. We got off of the metro at Navy Yard and headed to the park when Denise spotted someone wearing a Detroit Tigers cap. Turns out it was Joe and Sarah! Thanks for helping me plan that one Joe! 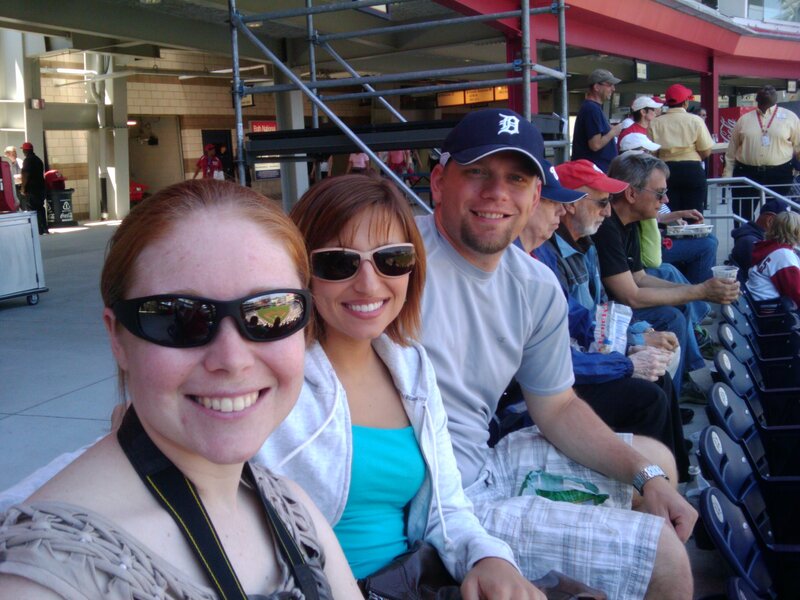 The game was fun (the Nationals pulled it out at the end) and the park was nice. We all skipped the metro and walked back into town for horrible service and bad food at the ESPN Zone. At least the water was wet. Just about everything else went poorly. We sent Sarah and Joe on their way home to Baltimore and headed back to the hotel ourselves to plan our assault on the memorials and the museums the next day. If you’ve never been to Washington D.C., here’s a word of advice: You can’t do it all in one day; at least not on foot. We started out walking along the south side of the river towards the Jefferson Memorial. 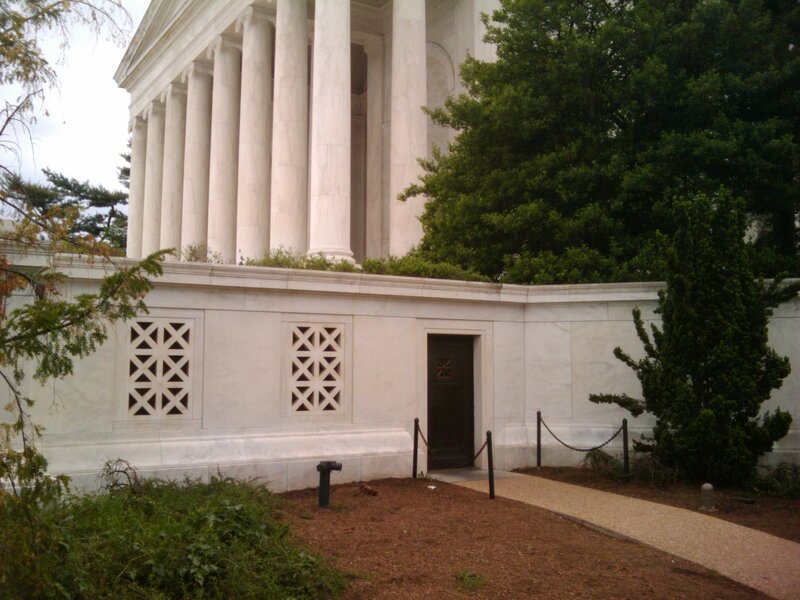 I took this sweet picture of the door you use to get into the Memorial in Fallout 3. If you've played Fallout 3, you know this door. 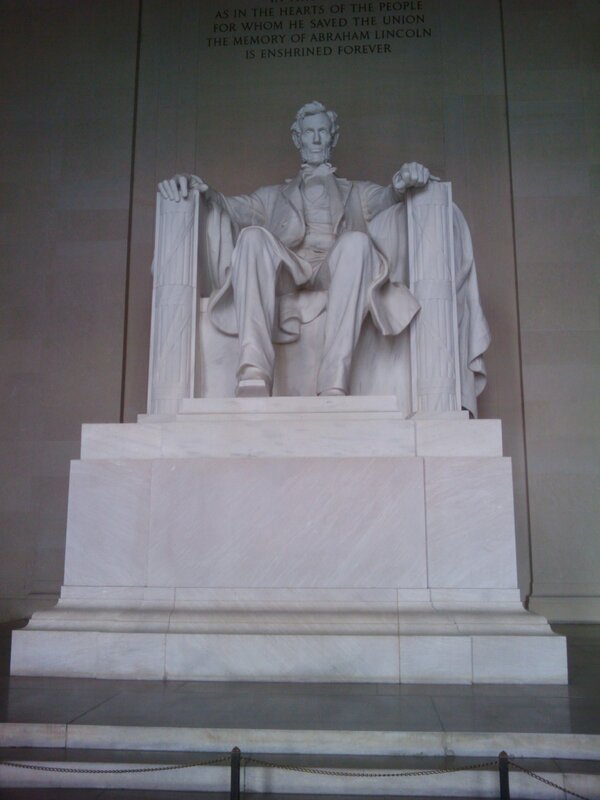 The large monuments are cool to look at, but don’t have a lot of character to them. 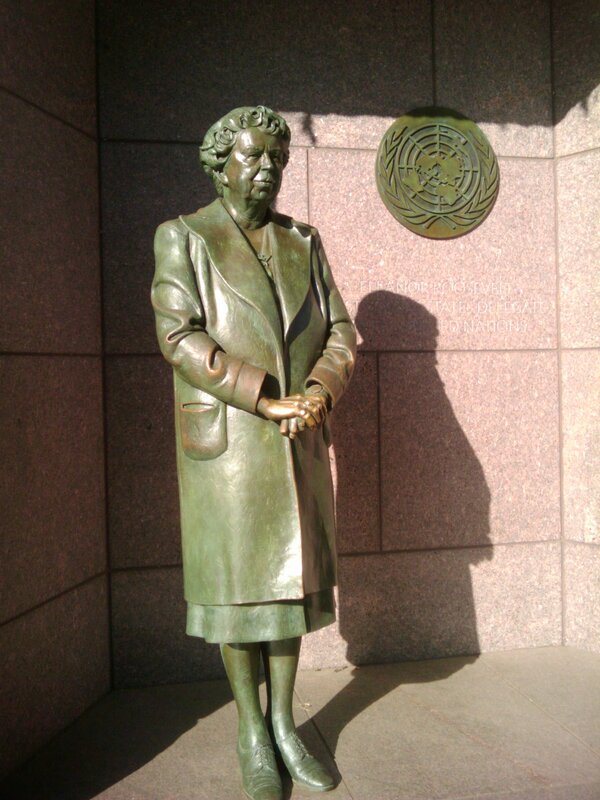 I really enjoyed the Franklin Roosevelt Memorial that we went to next. It’s unassuming – in fact, we stumbled across it by mistake. We didn’t even know it was there. It was more park than memorial. 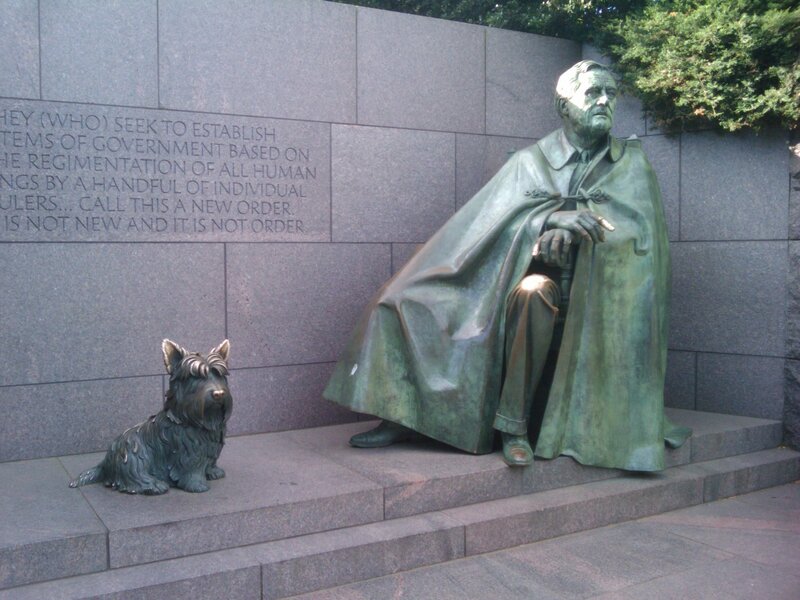 It had waterfalls, statues, and quotes from FDR. 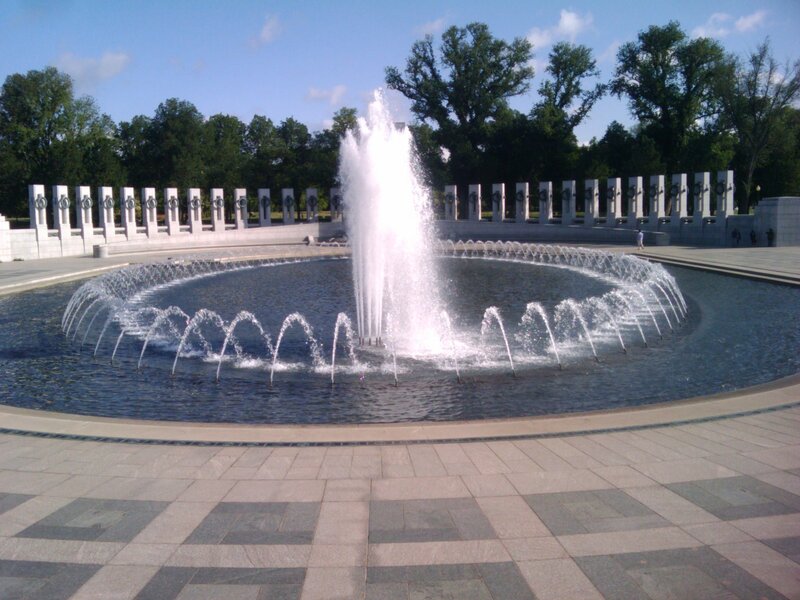 We continued our walk around to the World War II Memorial. It was a grand monument that celebrated the lives that were given to rid the world of two great evils. 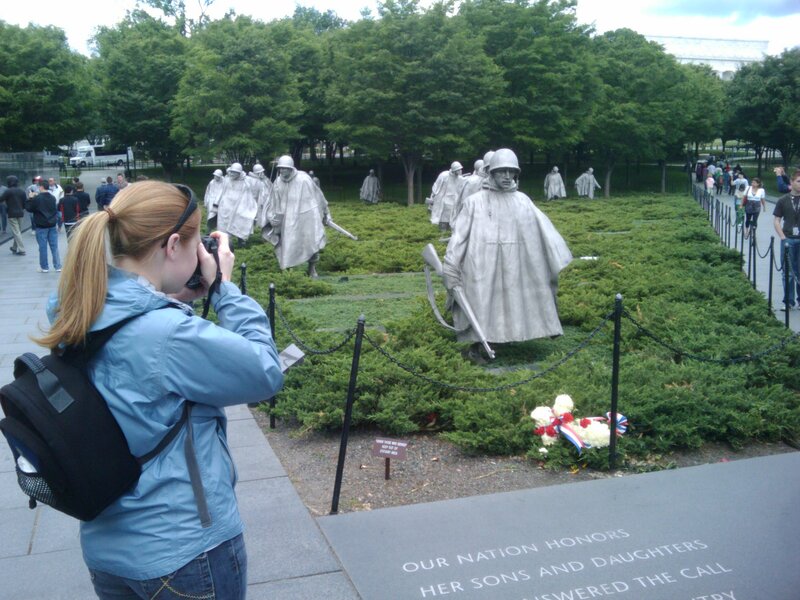 There was a large contrast between it and the Vietnam Memorial. 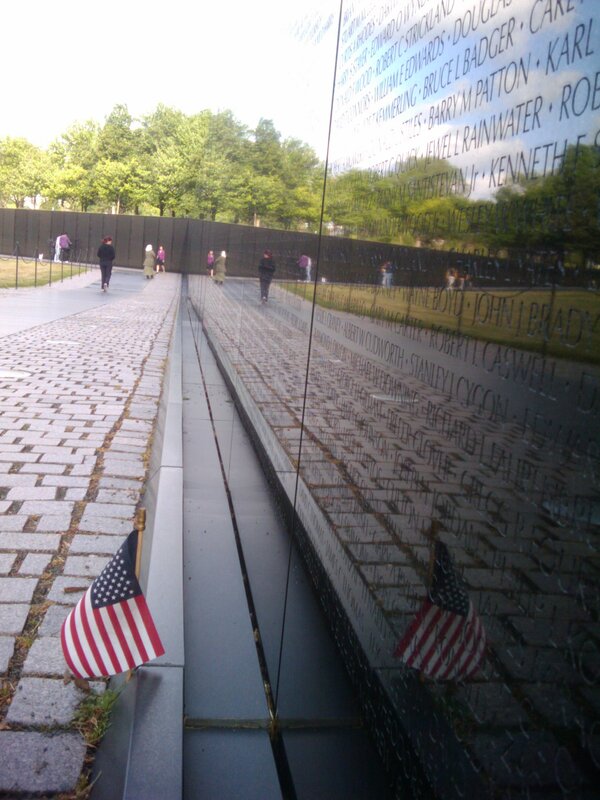 The Vietnam Memorial is sunk into the ground such that you cannot see it from the road. It is a somber reminder that not all wars are worth fighting, but if you are going to fight a war, you had better fight it to win it. We continued on to visit Mr. Lincoln in his iconic Memorial and then on to the soldier’s statues at the Korean Memorial. We had thought about walking across the river to Arlington National Cemetery, but by this time we were already whooped and had a long way to go yet. The next stop was the Holocaust Museum. My friends I had talked to said it was the best museum they had been to. After going there, I cannot disagree with them. The museum is extremely well done. The exhibits are perhaps the best and most informative I have seen. However, the subject material is horrendous and I was angry pretty much the entire time I was in there. If you do not know much about the Holocaust, you need to go. If you think you know a lot about it, you still need to go. Either way, be prepared for an emotional day. We hurried through the museum pretty quickly. It would have been easy to get stuck there for four or five hours. We caught the metro up a few blocks to go find food (there isn’t much on the south side of the mall. All the food seems to be north of Pennsylvania Avenue). We ate at Breuggers again, and then headed back down to more museums. We hit the Old Post Office (now with some stores, restaurants, and a free ride to the top of the tower), the Natural History Museum (with a great exhibit on human evolution), the Smithsonian Castle (there wasn’t much to do there, it’s really just administration offices), and the Air and Space Museum (cool, but we were too tired to care!). We then stumbled back to our hotel and passed out for an hour. It was four in the afternoon. For our evening encore, we took the Metro over to Union Station and found a Pizzeria Uno. We then walked back past the Capitol Building, Library of Congress, and Supreme Court. Denise got some great shots of the Capitol at night. You’ll have to make do with my cell phone pictures! All in all, it was about 9 miles of walking. The next day we got up early to drive home and made a bad decision. 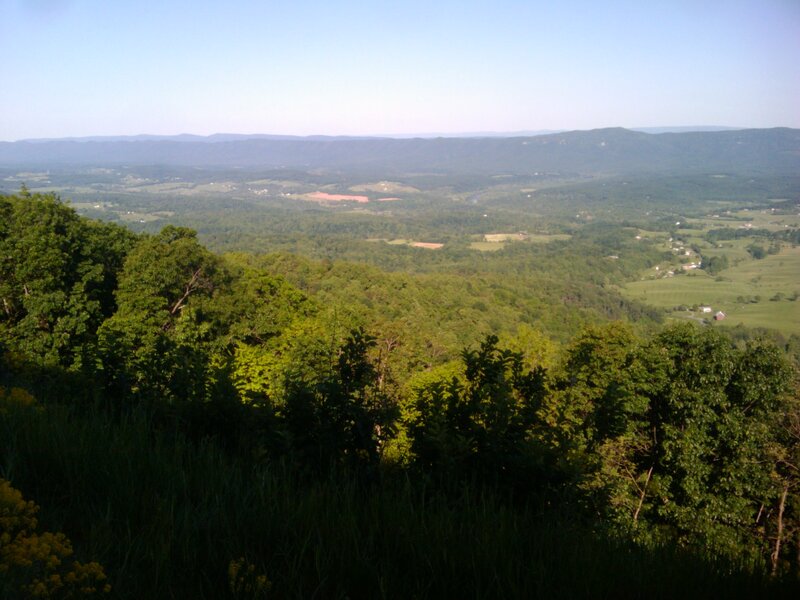 We thought it would be a great idea to drive the Shenandoah Skyline highway. We thought we could see some cool things and maybe see some history as well. We got there to find that the highway was 109 miles long! It did not look that long. The drive was neat, but with 75 overlooks along the entire drive, it was going to take all day. 90 minutes and 30 miles in, we decided to hop back on the expressway and make our way home. It still took all of 18 hours and we didn’t get to our house until just after midnight. It was a hectic and fun filled weekend. Happy Birthday Denise! Here’s some more pictures if you want to take a look. Check out the first post about the technology at the Microsoft Conference. Vegas, baby! I had the opportunity to attend the Microsoft Visual Studio 2010 and ASP.NET 4.0 Launch conference in Las Vegas from April 12-14, 2010. Here’s my impression of the city. The Bellagio is the coolest hotel that we went to; which is good because that’s where the conference was. There is a garden inside that must have had at least 10,000 flowers. It smelled great and had interesting sculptures. The pool area was amazing and the water fountain show out front was spectacular. Many of the other hotels have themes: Venice, Paris, Egypt, New York. I couldn’t quite figure out what the Bellagio’s theme was. I guess the theme must be Awesome. There’s a free tram between the Bellagio and the Monte Carlo, passing through the new City Center. We were happy to find it as it cut about 20 minutes of walking out of our self-enforced stroll to the Bellagio from our hotel. Geekfest at the Jet Nighclub in the Mirage. Microsoft, Telerik, and a few other sponsors rented out the nightclub for the convention from 7:30 until 10:30. We rolled in around 8:30 to find the party really hopping. There was a live band on the stage and free beer and pizza. There also happened to be a Little Black Dress convention sharing the nightclub with us. At least, that’s what it looked like at first. It became apparent that the extremely beautiful and friendly women came with the nightclub. Jason and I greatly enjoyed the Beauty and the Geek interactions. Most of the time, the girls looked very sociable and happy, but every once in a while you could see the disdain on their faces. One poor girl was subjected to ten minutes of hand rubbing by one of the geeks. You could see her say “My hands are sooo cold”, and then roll her eyes when he looked away. It was a fantastically entertaining evening. Microsoft made 200 diehard fans with that move. 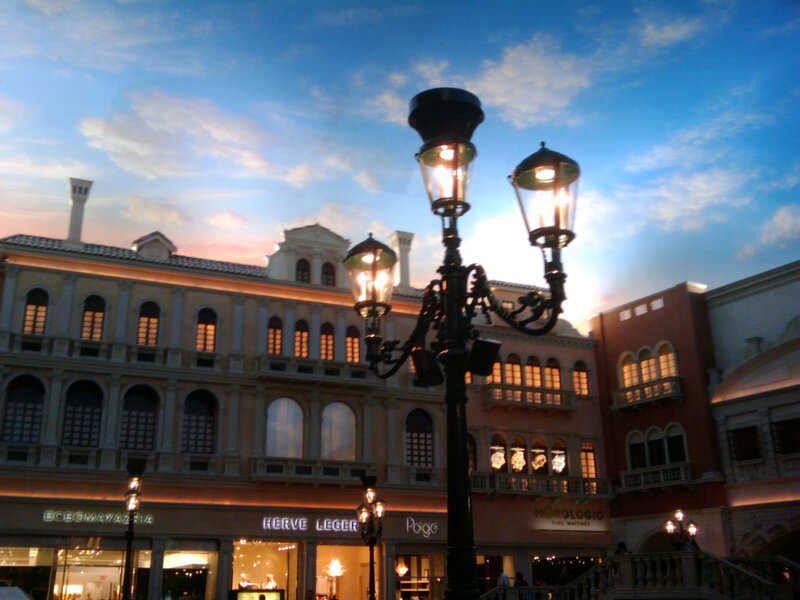 The Grand Canal at the Venetian is a real treat. We finally found it after going around in circles for fifteen minutes, and it was worth the trouble. We grabbed some gelato and watched a flutist (I prefer flautist, but what do I know (http://en.wikipedia.org/wiki/Flautist)) play with his band mates, and pose with a gaggle of Japanese tourists while continuing to play. We spent most of our free time walking up and down the strip. The hotels are all pretty cool, but my favorites in order were: Bellagio, Venetian, Caesar’s Palace, New York New York. We certainly didn’t make it in to all of them though. I was very grateful to Pete and Paul (my bosses at Mindscape @ Hanon McKendry) for sending Jason and I on this trip. Pete found us a deal for our hotel for the week, but I had to book it myself. When I went to Expedia, I found a hotel that was half the price of the one that Pete suggested and I thought it would be nice of me to book it. Plus, it was the Hooters Hotel and Casino. It looked like fun, and Jason and I both thought the two mile round trip to the conference wouldn’t be bad. We were very wrong. The hotel was a real hole in the wall, the walk was a drag after the first day, and we were off the beaten path. When I looked at Google Maps, it seems like it was pretty close to everything. I did not realize the size of the city blocks in Vegas! 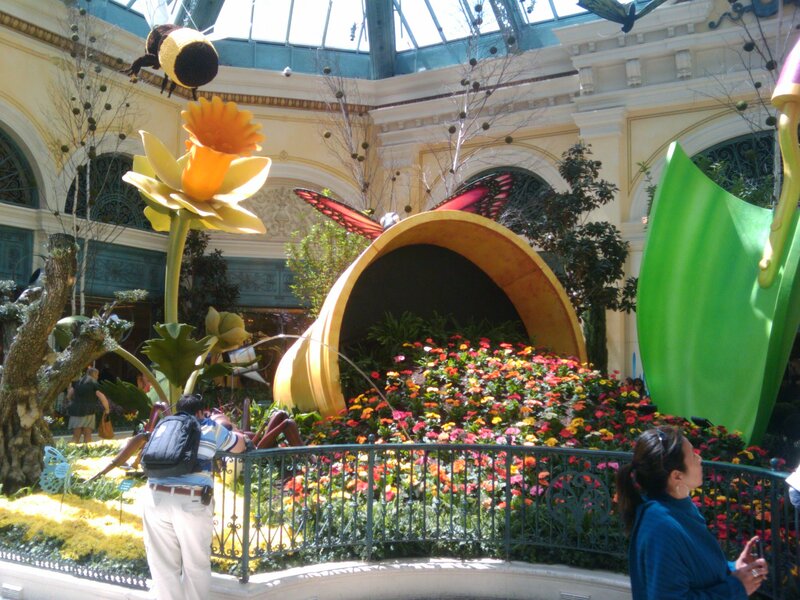 The food at the Bellagio was fairly disappointing. It was certainly fancy, but was not particularly tasty. Show prices are high. It is to be expected, I guess, but paying $65 to $150 dollars for a show just wasn’t in the budget. Neither was $150 to $200 for golf. We thought that would be fun to do with our free time Wednesday afternoon, but not at that price. If anyone was at the Kent County Airport on Sunday the 11th and found a silver iPod Shuffle on the ground, please return it to me. What a bad way to start the trip. After the conference ended, we had a lot of time to kill before our plane home. We didn’t have a hotel room to sleep in since we checked out in the morning, and we didn’t want to spend any money. It’s tough to kill time in Vegas without spending money, at least after you’ve already walked the strip ten times. After wasting a lot of time, I spent the last 3 hours playing 1/2 No Limit Hold ‘Em. That, at least, was fun. I only lost $11. At the Geekfest, only beer was free. Since I don’t drink alcohol often, that wasn’t good for me. I chose a Red Bull, and had to pay $10 for it. I paid more later – I was wide awake until three in the morning! Our plane ride back was torturous. We took the red eye back. With the four hours of sleep the night before, and the fact that I just don’t sleep well on a plane, I was wiped out by the time I got home. The lady to my left didn’t have that problem. She slept the whole time and often wanted to use me as a pillow. I had to put both hands on her shoulder and push pretty hard to get her to move! Denise hasn’t had a chance to go out to Vegas, so I’m sure we’ll make the trip back some day. I’m more interested in heading out to the mountains that ring the town, than I am in the Strip. I can spend a few days there, but that is about the limit. We left home at about 12:30 am. I was armed with a 5 hour energy, some wintergreen lifesavers, and chocolate-peanut butter malted milk balls that were oh so tasty. We somehow crammed 4 backpacks into the trunk of our Chevy Aveo, and myself, my wife Denise, and our friends Tim and Katie into the car. It was a tight fit, but we were on the road. It was a long and sleepless drive to our destination in Tennessee. We parked the car about 12 hours after we left and readied ourselves for our hike that started out around Abrahms Creek. Tim, Denise and I had gone backpacking twice together before, and Tim and I had gone backpacking in Los Angeles and spent a week in the Boundary Waters of Minnesota. Katie, however, was on her first multiple night hike in the mountains. The first day went really well, despite being exhausted from the drive. We had to ford a river that was up to our knees and it felt like there should have been ice cubes floating downstream. We reached camp early, skipped starting a fire, and just made Ramen using a can of sterno for heat. We were all whooped and in bed by 7:30. A refreshing twelve hours of sleeping in a small pad in the freezing wilderness, and it was time to move on. Saturday dawned bright and sunny, even if it was really cold to start. The temperature reached the mid sixties by the end of the day. We headed off around 9am with 9 miles to go before we were done. Katie was a little upset that nature somehow conspires to throw long uphill stretches in your path when it’s early. It seems to happen every time. And other than having a toe issue that slowed her down for that last hour, she did great. Some of the trails that second day were amazing. The first day followed what looked to be an old road, but on Saturday we were picking our way along narrow tracks on the sides of some big hills (in Glacier National Park, they’d be molehills. In Michigan, they are really large mountains. I guess it’s all about perspective.) We also hiked past Abrhams Creek Falls. They were really cool. We found a busy campsite for the evening and settled in for a big fire and some warm food. We knew that Sunday looked to have thunderstorms in store, so we called an audible and decided to hike out in the morning. The girls would take the quick way out while Tim and I would take the long loop past what we had planned to hike on Sunday and brave the thunderstorm. The first two hours found us climbing the mountain on Sunday, but we kept up a quick pace. Along some of the ridges, the wind was howling. It huffed and it puffed and it almost blew us off the mountain. Then it started to rain. I had recently purchased a full rainsuit and was actually eager to try it out. It worked great, and good thing too. The sky opened up and dumped on us for the next two hours. Luckily, when we made it back to the car after knocking out eight miles in just under four hours, the sky cleared up and the sun came out. There was a real bathroom at the campground where we had parked (yay!) and we were able to change and dry off. It was time to head home. As luck would have it, we heard on the radio that Michigan State had won their basketball game on Friday, and were playing in the Elite Eight in twenty minutes. We found a local Buffalo Wild Wings and stopped by. When we walked in, we were greeted by a sea of orange shirts. Michigan State was playing the University of Tennesse. UT is located in Knoxville, and we were only thirty miles south. That was a fun time! I was the only one cheering when MSU did something great, and I drew a few stares even though I tried to keep it under control. MSU pulled it out, we weren’t assaulted on the way out, and we made it home around three in the morning. It was a great weekend. Thanks Tim and Katie for joining us!